William Stevenson was born in Edmonton, Alberta, on May 7, 1934. He is the son of Alexander Lindsay Stevenson and Eileen Harriet Burns. He studied at the University of Alberta, obtaining a B.A. in 1956 and an LL.B. the following year. Called to the bar in 1958, he joined the law firm of Morrow, Morrow & Reynolds in Edmonton. 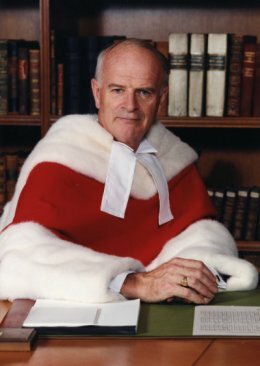 In 1959 he was counsel on the last case from Canada to be appealed to the Judicial Committee of the Privy Council in London, England. He became a lecturer at the University of Alberta in 1963 and a full-time professor of law five years later. In 1970 he returned to private practice but continued to lecture on law. He is the author of many legal texts and a founding editor of the Alberta Law Review. He was appointed to the District Court of Alberta in 1975 and to the Court of Queen's Bench of Alberta in 1979. A year later, he was appointed to the Alberta Court of Appeal, and on September 17, 1990, he was elevated to the Supreme Court of Canada. Justice Stevenson served on the Supreme Court for nearly two years before retiring on June 5, 1992.